I am so excited to let you know that this is my first blog post to include micro recipe videos! These are so much fun to create. If they seem a little rough at first - please bear with me - a little more practice and all should be smooth and finessed. borrowed the Bread Cloche from the Sur la Table Kitchen and was having great success. I posted my photos online and Emile Henry picked up my threads. They offered to send me the Baguette baker to experiment with - as a certified baguette obsessed baker - I could not have been more thrilled. The baker came with a booklet of nice recipes but I felt they needed more hydration so I changed the formula so that the baguettes were at 73% hydration. They were not super easy to handle but a little flour on the hands goes a long way. 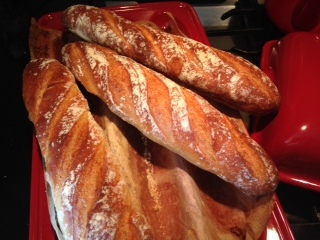 You don't need the Emile Henry Baguette to make these baguettes - but it really does a great job. Put it on your wishlist baguette aficionados, You will love it. A piece of parchment paper - cut it 8x10”this will support the baguettes during proofing and also line the baker during baking. You may have to trim it to fit the lid. 1. 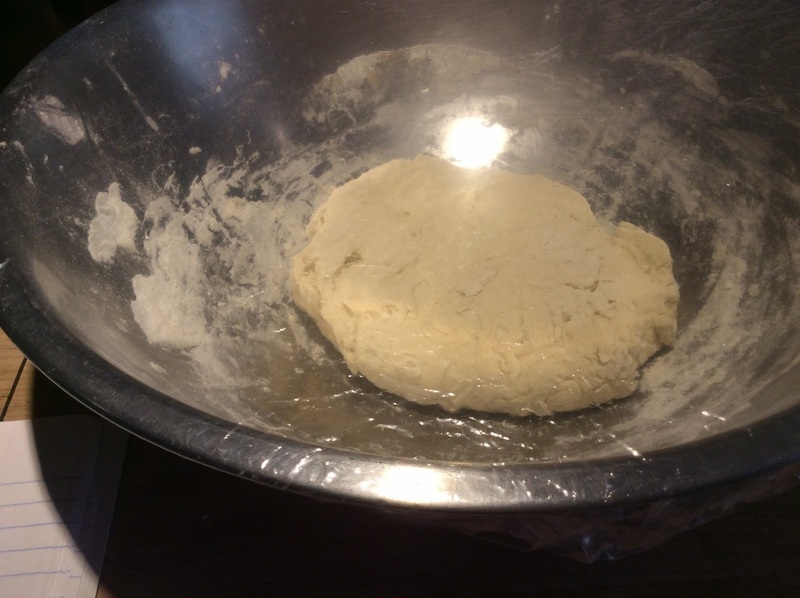 Combine the water and yeast in the mixing bowl – stir to combine, about 15 seconds. 2. Add the flour and salt. 3. Stir with the dough hook until the dough becomes a cohesive mass. If using the mixer, mix on speed one for 3 minutes. 4. Cover the dough with plastic wrap or a shower cap. 5. Let sit for 45 minutes at room temperature. 6. After 45 minutes give the dough a fold. Using the bowl scraper and starting at the bottom of the bowl fold each edge toward the center. Then turn the dough over so the smooth side of the dough is facing you. 7. Cover and let sit for another 45 minutes. 8. 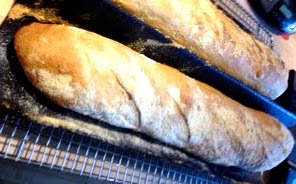 Fold again – 3 folds is optimum as folding strengthens gluten and your baguettes with have more volume. But two folds will also produce good bread. 9. After the second or third fold let the dough sit, covered for 10 minutes. 11. Shape the baguette as shown in the video clip. EH Baguette Demo 02 from Colette Christian on Vimeo. Load the baguettes onto the baker. 12. Place the baker in the proofing bag, add the cup of steaming water (3/4 full) and zip the bag shut. Check after 20 minutes. They may take longer but this is a good point for the first check. Preheat the oven to 450 degrees conventional or 425 degrees convection. 13. Your baguettes are proofed with they look like they have taken a breath and held it. In other words, they are slightly puffy, about a 1/4 larger then then were and have a slight marshmallow texture. Because they are baking in the Emile Henry Baker – we are under proofing them slightly. They will finish proofing as the baker warms up. 14. Remove them from the bag – let them sit for 5 minutes to form a slight skin – this makes them easier to slash. 15. Sprinkle the tops with flour, spray them lightly with water and slash them on a strong angle 3-five slashes. 16. Pop the top on the baker, slide it into the oven. 17. After 20 minutes, remove the top of the baker and let the baguettes bake uncovered for 5 more minutes. They should be an all over deep golden brown – if they are still light after 5 minutes bake them a few minutes longer. 18. Remove the baguettes from the baker and cool on a rack. Next assemble a plate of your cheeses and pates, invite your friends over, pour the wine and enjoy! Baguettes have no shelf life so freeze leftovers, well wrapped. Thaw at room temperature for a few hours and then refresh them, in a 350 degree oven for 5-7 minutes.